This activity comes with two worksheets. The first shows 12 pictures that students color purple for low and orange for high. 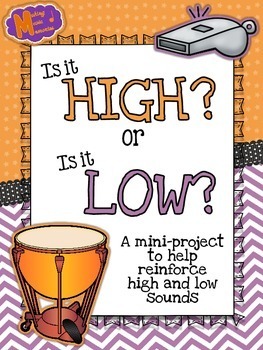 There are listening clips included in the file that students can actually listen to in order to get more practice. 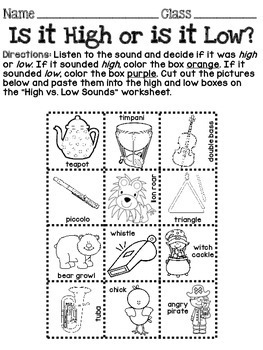 The second worksheet is a sorting worksheet where students can cut and paste the pictures they already colored into the correct place on the high and low worksheet. 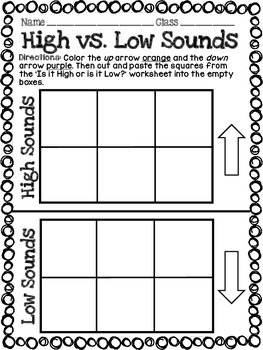 This will help them to get another visual of sounds that are high and low. It also allows for quick and easy assessment for the teacher. I appreciate ALL feedback! Please let me know what you think in the feedback section.